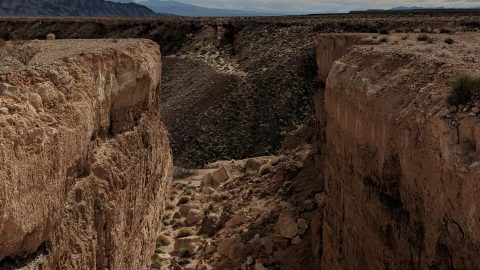 Double Negative is a piece of land art located in the Moapa Valley on Mormon Mesa (or Virgin River Mesa) near Overton, Nevada. 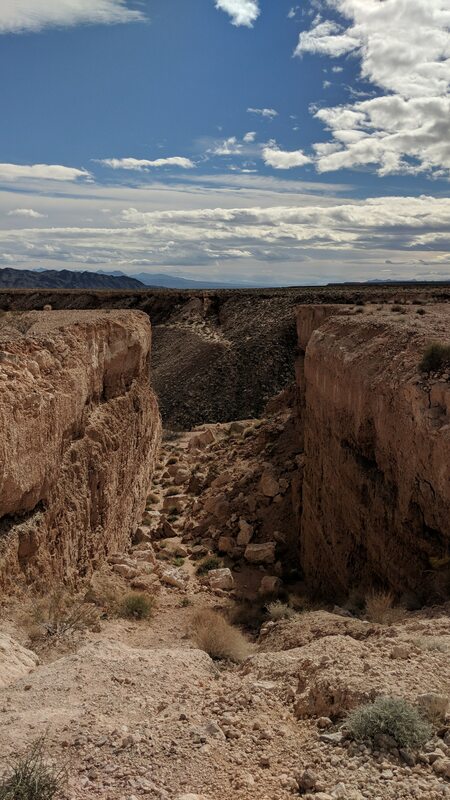 Double Negative was completed in 1970 by the artist Michael Heizer. When experiencing Double Negative there are no signs to the site or curatorial descriptions set in letraset on the wall, you define the work and create your own experience as an active participant. What you get out the work is whatever you put into your experience. 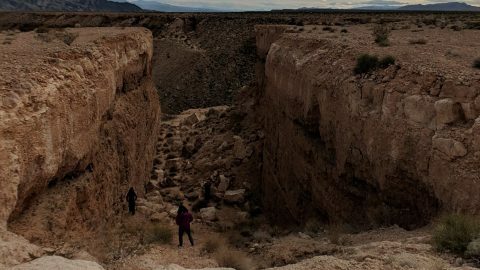 Without making a value judgment, either you see the work and feel the connection to the landart or you don’t. You’re completely left to your own definition. The transformation of the work makes visiting the site exhilaratingly because you realize you are changing along with the masterful art. 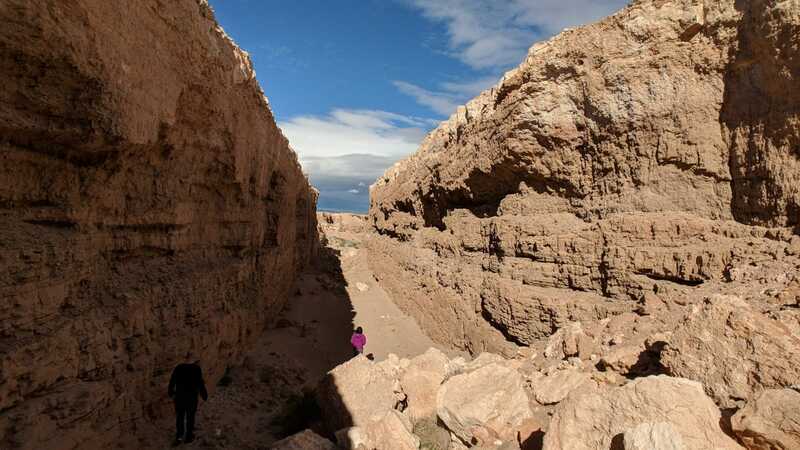 The work consists of a long trench in the earth, 30 feet (9 m) wide, 50 feet (15 m) deep, and 1500 feet (457 m) long, created by the displacement of 244,000 tons of rock, mostly rhyolite and sandstone. 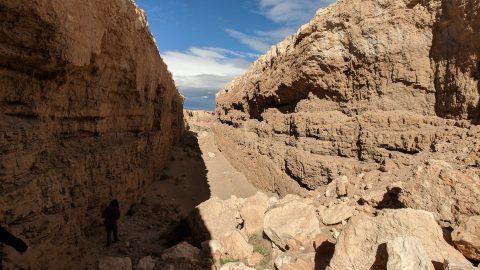 Two trenches straddle either side of a natural canyon (into which the excavated material was dumped). The “negative” in the title thus refers in part to both the natural and man-made negative space that constitutes the work. The work essentially consists of what is not there, what has been displaced. Planning a visit to Double Negative? It really is in the middle of nowhere. Prepare for conditions of extreme heat with no shade (especially in the summer months) – always bring water, some snacks, a hat, and sunscreen. It does get very windy with gusts blowing tumbleweeds and small pebbles that pelt you from seemingly every direction. Use caution, avoid traveling alone, and notify an outside party of your departure and estimated arrival time for safety. 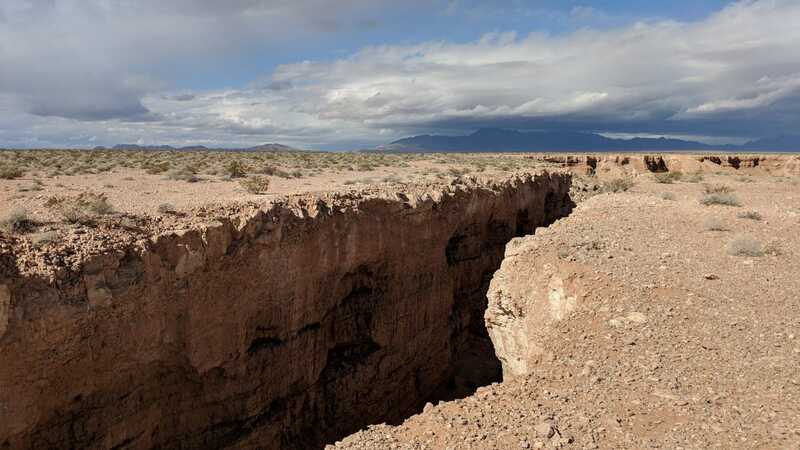 Double Negative is located about 80 miles from Las Vegas. It’s situated on the Mormon Mesa in Overton, Nevada. Admission to the Double Negative site is always free and there is open access all day and night year round. So where the heck is it exactly? If starting your adventure from Los Angeles, allow at least seven hours for travel. Keep in mind that the last 45 minutes is totally on unmarked dirt roads and some seasonal roads. A four-wheel drive vehicle with a high clearance and sturdy tires is recommended. 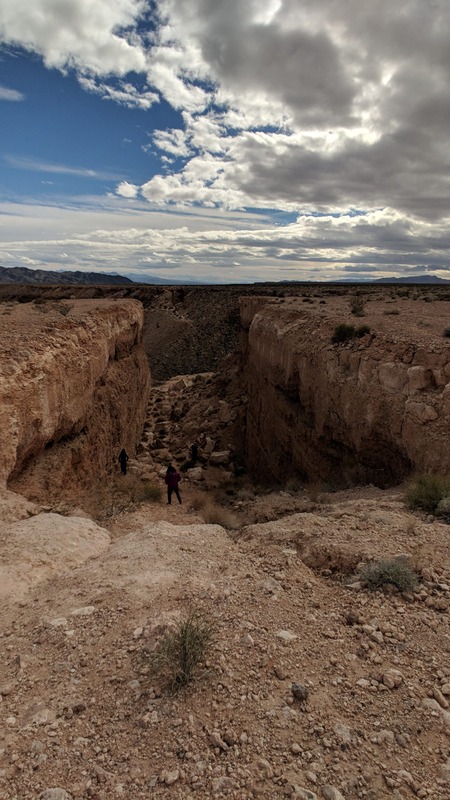 Double Negative is located in a very remote area of the Nevada desert, but it can be visited relatively easily from Las Vegas and Los Angeles. The journey requires travel on unpaved, rocky roads, so a vehicle with high clearance and four wheel drive is recommended. Take Interstate 15 North past Las Vegas to Route 169 (exit #93) to Overton. Overton is about a 2 1/2 hour drive from Las Vegas. From Las Vegas take I-15 N for 52 miles to Overton. Once on Overton, turn left onto Cooper Street, which leads to the Overton Airport. This will be a sharp left shortly after the Maverick Gas Station, Moapa Valley Community Center and Las Vegas Met. Police Station (on left) and the Post Office (on right). Continue on Cooper Street to Airport Road. Proceed up the road to the top of the Western edge of the mesa. As you pass the dump, it will turn into a dirt road. When you reach the top of the mesa, note mileage and continue straight across the mesa (do not go onto the immediate right or left road). After traveling 2.6 miles, keep your eyes to the left and make your first possible left (at 2.8 miles) onto a small dirt road, which is easy to miss. Note mileage again. 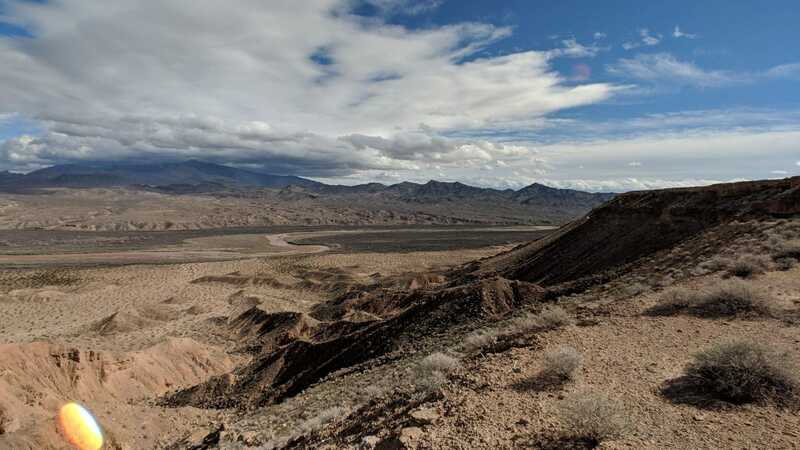 The road runs to the north, parallel to the eastern edge of the mesa where Double Negative is located (overlooking the Virgin River). Proceed carefully. Pass the first two notches in the mesa and a small U.S. Dept. of the Interior/Bureau of Land Management marker at right. Double Negative is located in the third notch. After traveling 1.3 miles, you will come to a fork, which leads to each cut of Double Negative. Bear right to the south cut. The left fork leads to the North cut. Allow at least a half hour before sunset to start leaving Double Negative as retracing one’s steps is very confusing. Go out to the main dirt road, turn right and go back down the mesa.